We have all heard of the ambitious US$100 billion (RM415.74 billion) Forest City project situated in the southern part of Peninsular Malaysia, but do you know why it is called Forest City? One reason is the mega-project’s vertical garden design, where the buildings will be covered by green plants. Forest City developer Country Garden Pacificview Sdn Bhd, a joint venture between Country Garden Holdings and Esplanade Danga 88 Sdn Bhd, has since 2015 built several buildings in the development in Iskandar Malaysia, Johor including apartments, retail block, hotel and sales gallery which have adopted the green facade design. Unbeknown to many, the green design actually originates from the headquarters of Country Garden Holdings in Guangzhou, China. Sitting on 7.52 acres of land in the Shunde district of Foshan city, China, the headquarters was completed in October 2013. It consists of a 22-storey main building and a 9-storey annex. It is the best example of how a vertical green building looks and functions, and EdgeProp.my had the opportunity to experience this first hand during a recent trip to the HQ. Despite the cloudy autumn morning, the flora on the building facades were lush and verdant. Walking through the main lobby entrance, you will be greeted by the Dream Corridor – a vast man-made forest canopy of trees and plants. Inside, vines cascade down from the upper corridors. It is obvious that the green forest theme continues inside the building. For instance, at the Landscape Design Centre where more than 800 staff come to work every week, there are pitcher plants dangling along the walkways, vines crawling up the columns and plants separating spaces while smaller potted plants sit on office desks. While most of the plants are being taken care of by a dedicated team, every staff is responsible for nurturing the plants on his or her desk, said the Country Garden staff accompanying the media on the tour of the HQ. “You can see there are a lot of pitcher plants here. Not only can they repel insects but they are also seen as a symbol of wealth,” she explained. 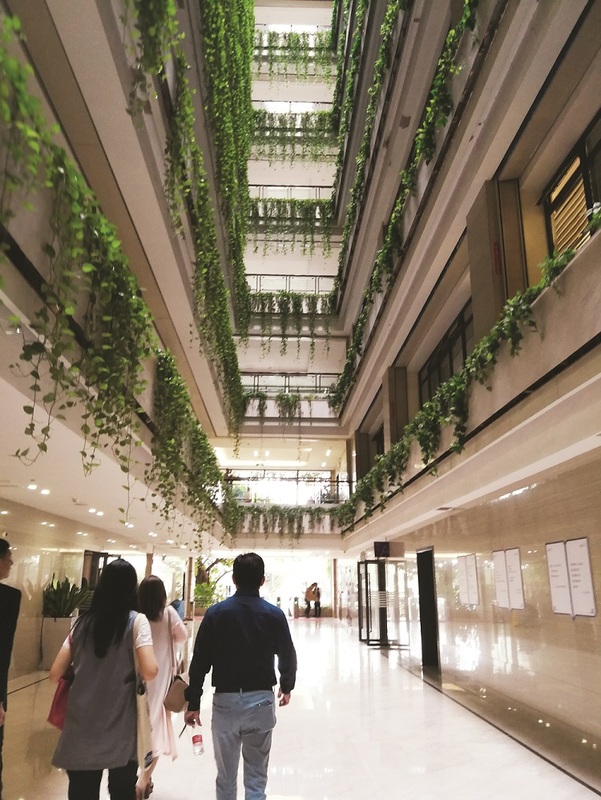 One of the benefits of having lots of greenery in the office is that it can help save energy, Country Garden Malaysia and Forest City director of strategy Ng Zhu Hann told EdgeProp.my. “During winter, the greenery on the building facade forms a shield that is able to conserve heat and thus help maintain a comfortable indoor temperature while in the summertime, the thermal cycling (alternate heating and cooling of a material) can accelerate indoor ventilation and lower indoor temperature when the cool air enters the building. “So this can ease the burden on heating during cold months and air-conditioning during the hot season, allowing us to save energy,” he said. On top of that, plants also help to create a healthy and positive work environment that will benefit the 12,500 employees who work at the office. “The low carbon and sustainable office building is a result of combining the concept of vertical greenery with eco, modern and minimalist design. “The flora that are planted in the small terraces on the building facade not only gives the HQ a stunning look but also provides a conducive work environment,” he said. 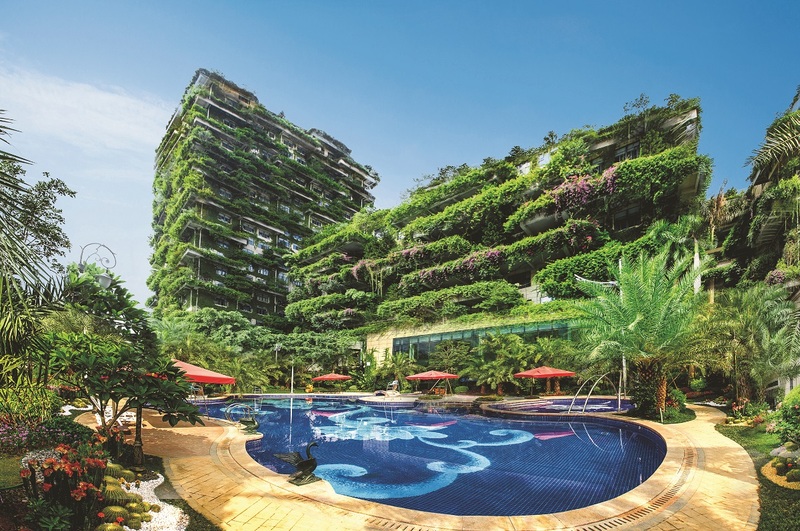 Ng noted that the developer uses climbing plants and clusters made up of different plants to maximise the plant coverage of the external and internal spaces which currently stands at 297,730 sq ft.
“We are applying the same design at Forest City. 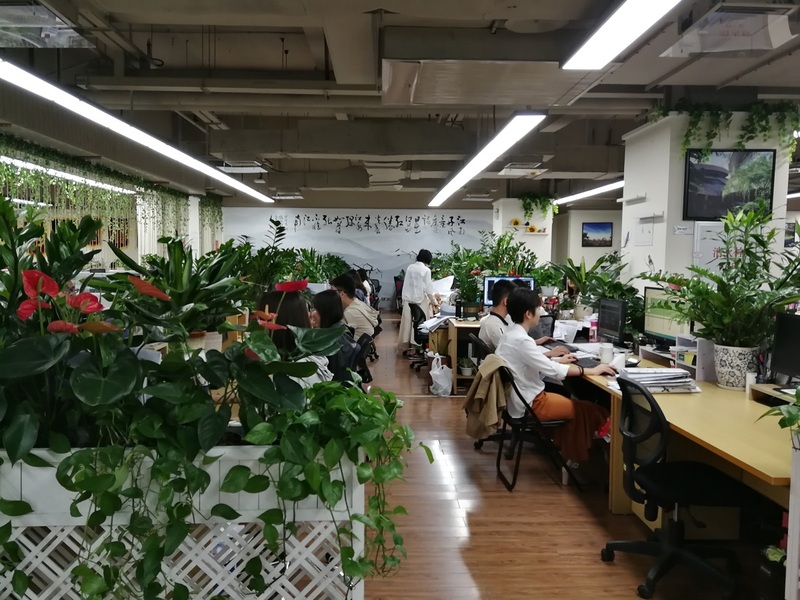 Although the plants that we are using in the project differ from those used in our headquarters in Guangzhou, it will bring the same benefits to the building and its occupants,” he said. While some may be concerned about the maintenance cost of the green landscape, Ng pointed out that there are ways to lower the cost while ensuring the sustainability of the vertical greenery. One is by using automated methods of plant irrigation such as by adopting drip irrigation and micro-sprinkler irrigation systems that are able to create a conducive environment for plants to grow with the least maintenance. Secondly, the developer uses native plants that are hardy and do not require a lot of maintenance. This has resulted in an effective greening effect which has minimal impact on the mortality of the plants.